Helicopter parenting is denounced by onlookers (e.g., David Brooks) as babying children who should be self-reliant, a highly valued characteristic in the USA. Children should not need parents but should use their own capacities to get through the day. The notion of a good person is intertwined with this individualistic view of persons and relationships. Good people know how to behave. They stand on their own, with little dependency on others. They are given rules and obey them. Bad people don’t–they are whiny and weak. It should be noted that when one applies this view to babies, to make them “independent,” one not only misunderstands baby development but creates the opposite result—a less confident, regulated and capable child (see Contexts for Young Child Flourishing). This machine-like view of persons and relationships contrasts, not only with what we know about child development (kids’ biology is constructed by their social experience) but with longstanding theories of virtue and virtue development. A virtue-theory approach to persons and relationships emphasizes their intertwining. One always needs mentors as one cultivates virtues throughout life. Relationships matter for moral virtue. One must be careful about the relationships one engages in or they can lead one astray. The high-demand definition of goodness in virtue theory suggests that few of us are truly good. Instead, most of us most of the time act against our feeling, behave in ways that counter our best reasoning, or completely miss noticing the need for moral action. In other words, our feelings/emotions, reasoning, inclinations are not harmonious but in conflict. Some philosophers are particularly concerned with the inconsistencies in people’s behavior—for example, a person might be honest on taxes, but dishonest in business dealings or interpersonal situations. However, among social-cognitive psychologists inconsistency is not a surprise. Each person has habitual patterns of acting one way in certain types of situations and a different way in another type of situation. Traits like honesty don’t adhere to a person like eye color but vary from situation to situation, e.g., outgoing with friends but shy with strangers. Individuals show consistent patterns of behavior for particular types of situations (person by context interaction). Thus, a person may have learned to be honest on taxes but not yet have learned how to be honest in business or has other priorities when with family. Expertise also plays a role in that when someone is new to a domain: behavior will be inconsistent as one learns the ins and outs of best behavior. All of us need mentors to help us learn good behavior for particular situations. Virtue is a lifelong endeavor. Darcia Narvaez is Professor of Psychology at the University of Notre Dame, and a Scholar with Virtue, Happiness, & the Meaning of Life. This blog post originally appeared on OUPBlog, the blog for Oxford University Press. The editing of Developing the Virtues was performed under the auspices of the Self, Motivation and Virtue Project, supported by a generous grant from Templeton Religion Trust. Darcia Narvaez discussing ecological virtue, as part of the 2016 “Virtue & Happiness” Summer Seminar. Darcia Narvaez, Professor of Psychology at the University of Notre Dame, will join the next two working group meetings as a scholar with the project Virtue, Happiness, & the Meaning of Life. Narvaez’ research focuses on evolutionary theory, neurobiology, positive psychology, and indigenous perspectives in considerations of wellbeing, morality and wisdom across the lifespan. Author or editor of over 140 academic articles and chapters and 13 academic books, her most recent authored books include Embodied Morality: Protectionism, Engagement and Imagination, and Neurobiology and the Development of Human Morality: Evolution, Culture and Wisdom, which won the William James Book Award from the American Psychological Association. Narvaez will join the rest of the scholars at the December 2016 and June 2017 working group meetings. This week on the Virtue Blog, I’ll post photos from our first summer seminar, “Virtue & Happiness”. I took our group photo on the grounds of Moreau Seminary, the location for our week-long series of seminars, discussions, great food, and walks around the lakes. Click the photo to make it larger! From left: Darcia Narvaez, Chip Lockwood, Kristina Grob, Anne Baril, Jason Welle, Indra Liauw, Fr. 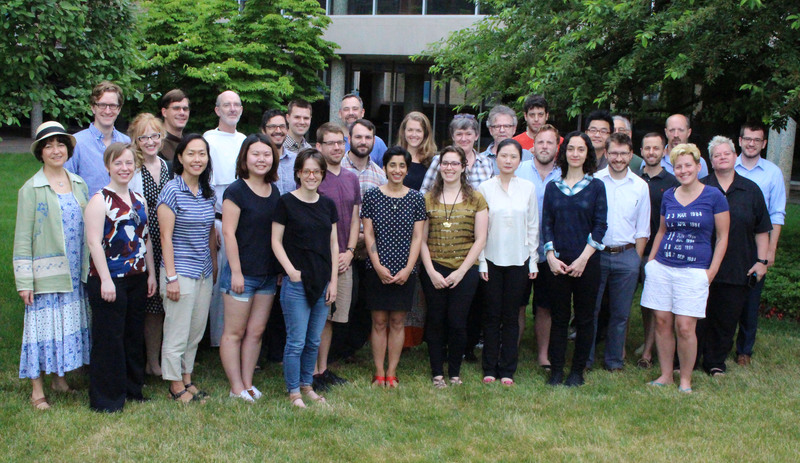 Michael Sherwin, Wenqing Zhao, Santiago Mejia, Olivia Bailey, Ryan Darr, Gus Skorburg, Leland Saunders, Mihailis Diamantis, Sukaina Hirji, Jennifer A. Frey, Hollen Reisher, Candace Vogler, Owen Flanagan, Yuan Yuan, Amichai Amit, Brian Ballard, Parisa Moosavi, Sungwoo Um, Anselm Mueller, John Meinert, Samuel Baker, Tom Angier, Kate Phillips, Jaime Hovey, Matthew Dugandzic. Photo by Valerie Wallace. We’re in residence for a week at Moreau Seminary at the University of Notre Dame with a group of young scholars and five faculty for our first summer seminar, “Virtue & Happiness”. Live tweeting the presentations and discussions @UChiVirtue #VHML16. Here’s a sample! Follow us here for more. Darcia Narvaez is professor of Psychology at the University of Notre Dame and the Executive Editor of the Journal of Moral Education. She specializes in ethical development and moral education. She also blogs for Psychology Today at “Moral Landscapes” and this summer, will be one of the faculty for the Virtue, Happiness, and Meaning of Life’s collaborative Summer Seminar, “Virtue & Happiness”. Valerie Wallace, Associate Director, Communications, interviewed Professor Narvaez in early March 2016. Valerie Wallace: What is evolutionary parenting? Darcia Narvaez: Evolutionary or primal parenting refers to providing the nest that humans evolved to for their children. Every animal has a nest for its young that matches up with the maturational schedule of the offspring. Humans do too. Moreover, humans are especially influenced by their post-natal experiences because we are born 18 months early compared to other animals, and more epigenetic effects (gene expression influenced by experience) occur postnatally for humans than for any other animal. Each person is a dynamic system whose early experiences influence the trajectory of who and what he or she becomes. Adults in “civilized” societies have degraded the nest for the young for some time (10,000 years? ), meaning that a species-atypical developmental system is now “normal” for the young. This, of course, necessarily results in species-atypical individuals, communities and cultures. But this has happened gradually over time so that we don’t realize it, except to know sense that something is terribly wrong with humanity. How do we know what is species typical? The anthropologists have noted that all over the world the same nest is provided by small-band hunter-gatherers (SBHG), the type of society in which the human genus spent 99% of its history. The members of studied SBHG societies have similar personalities: pleasant, calm, fiercely egalitarian, generous, content, and generally peaceful. Of course we do not want to and could not return to living like these societies, but we can learn about how a species-typical nest shapes personality and morality. What is the nest that brings about these outcomes? The human evolved nest or niche, very similar to that of social mammals generally (who emerged over 30 million years ago), includes soothing perinatal experiences, extensive breastfeeding (2-5 years); nearly constant touch or physical presence; responsiveness to needs (in baby hood it means keeping the baby from getting distressed); play from birth, which later includes self-directed free play in the natural world with multi-aged mates; positive social support for mom and child (which includes a sense of belonging); and multiple responsive adult caregivers. There is converging evidence from neuroscience, clinical studies, anthropology and developmental sciences on the importance of all these components for optimal mental, physiological, social, emotional and moral development. In other words, every move away from these components creates toxic stress for the growing brain and undermines optimal development. Valerie: Tell me about your interest and research exploring torture and moral development. Darcia: What happens when adults don’t provide the species typical nest is that children’s functioning in hundreds of systems and subsystems is undermined. They turn into people who are stress-reactive, easily perceiving threats from anything unfamiliar and feeling like they live in a dangerous world. When the stress response is activated, blood flow shifts away from higher order capacities including reasoning, open-mindedness and compassion. A stressed baby grows in the wrong direction—developing dispositions towards self-protectionism instead of relational attunement and communal imagination, which normally develop with the right hemisphere’s more rapid development in early life. Undercare, the lack of the evolved nest (evolved developmental niche), leads to adults who have diminished human capacities. Species-atypical development leads to the atypical outcomes we see all around us, especially in the USA: adults with insecure social relations who want to dominate or withdraw from relational attunement. They don’t realize that they are socially unskilled and imaginatively impaired. They think the one-up/one-down orientation to relationships that forms from an overreactive stress response is just the way the world works. They have a deep distrust, established in babyhood, that people are not to be trusted, the world is not to be trusted, nor are their own spirit’s impulses (that’s what you learn when the adults around you disregard your needs for the evolved nest). With “empty selves” they end up latching onto ideologies of various kinds (religious, business, economic)–rigid scripts, to feel safe. They did not learn to be morally agile and flexibly attuned to others so “difference” is scary, “otherness” is turned into evil. One gets susceptible to rhetoric of dominance and power (much like Donald Trump is presenting in the presidential campaign), including that torture works (it doesn’t) because one also has lesser empathy for others. You seem to have such a dynamic relationship with research and writing. That is, within the huge field of moral development and education you allow yourself to ask many questions, and go after them. How do you decide what’s next? Darcia: I follow my muse. I’ve learned that when you have a creative spirit, if you don’t follow it, you become unhappy or unwell. So I follow the muse, always surprised where it leads because it usually is not in the direction I deliberately planned (e.g., becoming a professional musician, seminarian, business owner, classroom teacher). This was also true for my recent book, Neurobiology and the Development of Human Morality: Evolution, Culture and Wisdom, which ended up where I did not anticipate. Valerie: On what journey did this book take you? Darcia: Neurobiology and the Development of Human Morality: Evolution, Culture and Wisdom led me to more greatly appreciate the societies who live wisely and sustainably and, as part of their worldview, function as members of a biocracy– treating other-than-human entities as members of the community to be respected and honored as partners or even teachers. If we are to save our species and many others, we must readopt this indigenous perspective. First Nation peoples do not compartmentalize life; they have deep knowledge of their local landscapes that allows them to foster biodiverse flourishing. I am chairing a conference September 11-15, 2016 called “Sustainable Wisdom: Integrating Indigenous Knowhow for Global Flourishing”. We have many indigenous speakers coming from multiple disciplines to discuss how to figure out a new way of being human in cooperation with the earth. Valerie: Why did you say “yes” to teaching with us for our summer seminar “Virtue & Happiness”? Darcia: In our ancestral environment (small band hunter gatherers), virtue went hand in hand with survival but also contentment. “Civilization” has blown apart human relations to the earth, which undermines a sense of place and belonging (as a creature of the earth in a biodiverse community of creatures), and deracinates the possibility of normal virtue development because children in species-atypical nests are typically forced to divorce themselves from their own feelings, from intimacy and from the landscape (e.g., when they are discouraged to play freely outside in a natural environment). We have disordered ourselves on so many levels in so many ways that we have to figure out how find our way back to flourishing for All. Every opportunity to think or share about how to revamp ourselves for virtue or happiness is one I try to take. Darcia: Thanks for inviting me. Our summer seminars (2016, 2017) at the University of Notre Dame are geared toward early career researchers and advanced (finished with coursework) doctoral students in Philosophy, Psychology, and Theology/Religious Studies. Each seminar participant attends each topic. The Seminar is intended for outstanding advanced-level graduate students and early career researchers in the areas of Philosophy, Psychology, and Theology/Religious Studies. Our aim is to involve participants in our innovative and collaborative research framework within these three fields, and to provide an engaged environment to deepen and enliven their own research. Owen Flanagan is James B. Duke University Professor of Philosophy at Duke University. He works in philosophy of mind, ethics, and comparative philosophy. His book, The Geography of Morals: Varieties of Moral Possibilitywill be published by Oxford University Press next year. Mencius, 4th c. BCE thinks there are four sprouts in human nature that if cultivated by the self and one’s community yield the virtues prized by Confucian ethics. The virtues are not sufficient for a good human life, but they are necessary. We’ll read and selections from Mencius and compare and contrast his view with modern psychological theories that posit sprout like foundations or modules upon which all moralities are built. Aristotle thought anger is a virtue if contained, if it is moderate, at the mean. Stoics such as Seneca challenged the Aristotelian view, arguing that anger should be (and can be) eliminated. Shantideva (8th c. CE), an important India Buddhist, made similar arguments for the elimination of anger in an entirely different tradition. We’ll discuss the Aristotelian, Stoic, and Buddhist views as well as objections and replies. Jennifer A. Frey is an assistant professor in the philosophy department at the University of South Carolina and principal investigator with Virtue, Happiness, and the Meaning of Life. Prior to joining the philosophy faculty at UofSC, she was a Collegiate Assistant Professor of Humanities at the University of Chicago, where she was a member of the Society of Fellows in the Liberal Arts and an affiliated faculty in the philosophy department. She earned her PhD in philosophy at the University of Pittsburgh, and her B.A. in Philosophy and Medieval Studies (with Classics minor) at Indiana University-Bloomington. Her research lies at the intersection of philosophy of action and ethics, with a particular focus on the Aristotelian-Thomist tradition. We will explore the role that a general conception of happiness plays in the explanation of human action and in an account of practical reason. We will focus on writings from Thomas Aquinas and Elizabeth Anscombe, and we will put these into dialogue with contemporary action theorists and ethicists. Darcia Narvaez is Professor of Psychology at the University of Notre Dame. She publishes extensively on moral development and education. Her most recent book is Neurobiology and the Development of Human Morality: Evolution, Culture and Wisdom (2014, Norton). She is executive editor of the Journal of Moral Education. She also writes a popular blog for Psychology Today (“Moral Landscapes”). Neurobiological sciences provide increasing empirical evidence that early experience shapes capacities for sociality. These also influence morality and we can now delineate how moral development can go awry and how to at last partially repair it. Humanity spent 99% of its history in small-band hunter-gatherer societies. These societies all around the world provide an early “nest” for their young that is slightly more intense than what emerged with social mammals over 30 million years ago. The species typical nest leads to a species typical human health, personality and nature whereas a species-atypical nest leads to the types of maladaptation and pathology seen in advanced nations like the USA. Michael S. Sherwin, O.P., is Professor of Fundamental Moral Theology at the University of Fribourg, Switzerland. He has also taught at the Graduate Theological Union in Berkeley, California, where he received his initial formation as a Dominican and was ordained a priest in 1991. Fr. Sherwin is director of the Saint Thomas Aquinas Institute for Theology and Culture and of the Pinckaers Archives. Author of articles on the psychology of love, virtue ethics and moral development, his monograph, By Knowledge and By Love: Charity and Knowledge in the Moral Theology of St. Thomas Aquinas (CUA Press, 2005) has newly been reissued in paperback. The account of character formation and moral development advanced by recent studies in philosophy and psychology offer a wonderfully helpful preparation for the Christian conception of the moral life. They prepare us both to see how grace heals and elevates human nature and to recognize the difference that grace makes: the exclusivity and self-sufficiency of the pagan ideal of virtue gives way in Christ to universality and divine dependence, a dependence that makes possible a life of moral excellent beyond what even the most brilliant pagan philosopher could have imagined: intimate friendship with God in a life that participates in the economy of salvation. This session offers an introduction to this fully Christian vision of moral development proper to the infused virtues of faith, hope, charity and the other infused virtues that belong to the Christian life. What does it mean to love God and neighbor, and what is the relationship between this love and God’s love for us? Throughout the long history of Christian reflection on the character of Christian charity (agape), there has been a tension between love as desire and love as service. Is charity primarily the desire for God as our happiness and fulfilment, or is it exclusively the service of God, that seeks nothing for itself? Or is there a third element to charity that incorporates both service and desire, placing each in its proper perspective: love as the celebration and affirmation of the other? This session offers an introductory treatment of these questions by proposing both a renewed psychology of love and a renewed theology of charity’s relationship to Christ and his cross as the true and living way to heavenly beatitude. Candace Vogler is the David B. and Clara E. Stern Professor of Philosophy and Professor in the College at the University of Chicago, director, and a principal investigator with Virtue, Happiness, and the Meaning of Life. She has authored two books, John Stuart Mill’s Deliberative Landscape: An essay in moral psychology (Routledge, 2001) and Reasonably Vicious (Harvard University Press, 2002), and essays in ethics, social and political philosophy, philosophy and literature, cinema, psychoanalysis, gender studies, sexuality studies, and other areas. Her research interests are in practical philosophy (particularly the strand of work in moral philosophy indebted to Elizabeth Anscombe), practical reason, Kant’s ethics, Marx, and neo-Aristotelian naturalism. On a roughly Thomist account, acquired virtue aims at the common good and is, to that extent, inherently self-transcendent. I am interested in considering whether the link goes in the other direction as well–are all of the forms of self-transcendent activity and engagement we are considering virtuous? Are they expressive of specific virtues? Are they linked in a more general way to cultivated good character? On the understanding we have been using, we can’t have virtue without an element of self-transcendence. Can we have self-transcendence without virtue? Paul T.P. Wong, PhD, C.Psych is Professor Emeritus, Trent University, Adjunct Professor, Saybrook University, and a Fellow of APA and CPA. He is President of the International Network on Personal Meaning (INPM) and the Meaning-Centered Counselling Institute. In addition to being the editor-in-chief of the International Journal of Existential Psychology and Psychotherapy, he has edited two influential volumes on The Human Quest for Meaning (Routledge). A prolific writer, he is one of the most cited existential and positive psychologists. Since 2000, he has organized eight well-known and well attended Biannual International Meaning Conferences. He is the originator of Meaning Therapy, and he has been invited to give keynote addresses and meaning therapy workshops worldwide. He is the recent recipient of Carl Rogers Award from Div.32 (Humanistic Psychology) of APA. I will approach the topic of self-transcendence from both empirical psychological findings on the role of self-transcendence in wellbeing, and from Viktor Frankl’s seminal work on self-transcendence as the essence of spirituality and logotherapy. First, I will explain why Frankl’s self-transcendence is inherently virtuous, because of its emphasis on serving the common good or a higher purpose according to the ethical dimension of following one’s innate conscience and the time-tested universal value of love one another. Frankl’s concept is very important and relevant in the current context of international terrorism. Frankl took pain to emphasize the interpersonal ethical responsibility of self-transcendence to prevent another Hitler or terrorism in the name of false and bad kind of self-transcendence. Then, I will introduce specific interventions and demonstrate how to experience the cherished values of meaning, virtue and happiness through the spiritual practice of self-transcendence in daily life. We will accept up to 25 students. The seminar is highly intensive, meeting twice a day for one week on each of the topics below and continue conversations informally over meals. This seminar is supported by a generous grant from the John Templeton Foundation and our institutional partner the Jacques Maritain Center, and includes lodging, meals, tuition, and reimbursement up to $500 for travel. Accepted participants will be asked to pay a $200 registration fee. “Virtue and Happiness” is June 12-17, 2016. The seminar is geared toward advanced PhD students and early researchers. Our aim is to involve participants in our innovative and collaborative research framework within psychology, theology/religious studies, and philosophy, and to provide an engaged environment to deepen and enliven their own research. Acceptance includes tuition, lodging, meals, and up to $500 in travel. For more information including topic descriptions, and to apply, visit https://virtue.uchicago.edu/summer-seminar-2016. Virtue, Happiness, & the Meaning of Life is a new project which has received $2.1 million from the John Templeton Foundation for collaborative research in the areas of psychology, theology/religious studies, and philosophy, focused on self-transcendence to advance understanding of the interrelations of virtue, happiness, and the meaning of life. Click the image below for the full poster.